IWC Schaffhausen’s official motto that was established in the year 1903 is “Probus Scafusia” which means “good quality craftsmanship from Schaffhausen”. Founded in the year 1868 by Florentine Ariosto Jones, the heights of fame and fortune it would reach had not been anticipated then. Florentine Ariosto Jones was an American watchmaker and an engineer and was working with a leading watch manufacturer known by the name of E. Howard and Co. He had a vision of amalgamating the US engineering technology with the fine craftsmanship of the Swiss. During those times it was very easy to procure good craftsmen at very low wages in Switzerland. They were at that time operating on small scales from their homes itself. Thus when Jones came to Switzerland with bright ideas of setting up a factory, he had to initially face strong opposition as the craftsmen feared for their jobs. Later in 1850 during the Industrial Age, Schaffhausen was still lost to the reality of the changing ways of the whole world. At this stage, the renowned watch maker and manufacturer Johann Heinrich Moser came to their rescue by building their first hydroelectric plant. 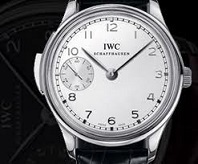 Later he developed a keen interest in Florentine Ariosto Jones’ plans and they both together launched the IWC in the year 1868 in Schaffhausen. Crafted by IWC, the renowned Swiss manufacturer of high-end premium watches, IWC Portuguese Minute Repeater is a true beauty in every sense of the word. This watch was specifically crafted keeping in mind the requirements of Portuguese sailors who needed precise time-keeping. During olden days, the Portuguese sailors kept a sandglass to measure the speed at which their ship travelled. The ship had a handy bell that would be struck at regular intervals to apprise them about the time. This concept of amalgamation of acoustic with abstract time telling was incorporated with finesse in IWC Portuguese Minute Repeater. When you depress the slide in the watch, you can hear a distinctive strike train that audibly sounds the time for minutes, quarters and hours. In the year 2009, a few changes were incorporated in the watch. A 1.7 mm increase in height was given to the case and the diameter was also increased by 1 mm. The seconds display was altered to 6 o’clock and the watch movement was changed to a 98950-caliber with hunter pocket watch movement. To make the overall look more stylish, some early Jones calibres were also incorporated in the watch. It also displays a unique nickel-silver plate and bridge with exquisite engravings that are gold plated. Both the versions are a limited edition of just 500 watches.